It is the height of berry season. What better way to enjoy it than a yummy cobbler. I made mine in my trusty cast iron skillet. Maybe its a southern thing but I think it cooks better like that. Did you know they call it cobbler because the top is supposed to look like cobblestones? Mine does, and it also tastes really good. Try it, you will be very glad you did. In a large bowl combine apple pie spice, sugar, salt and cornstarch. Add the blueberries and peaches. Mix coating the fruit with the sugar mixture. Toss with the orange juice and zest. 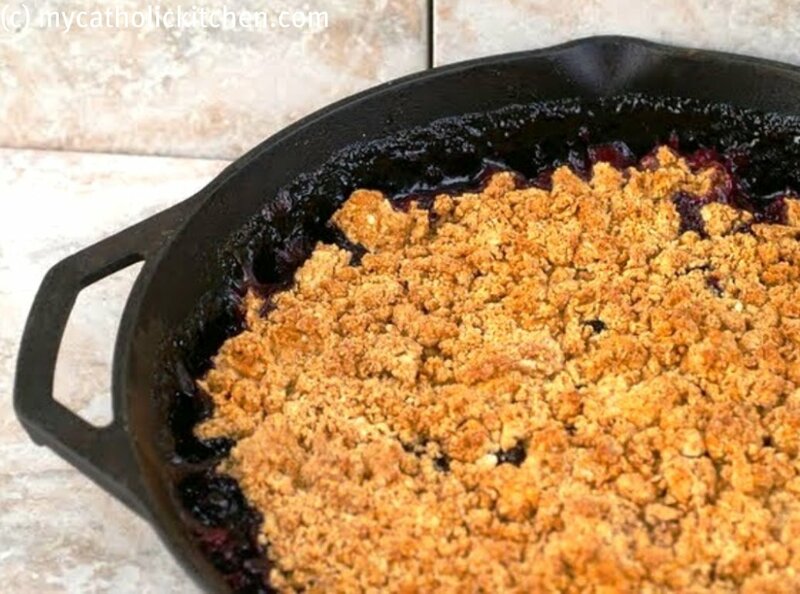 Put the fruit filling in a cast iron skillet and bake for 15-20 minutes. 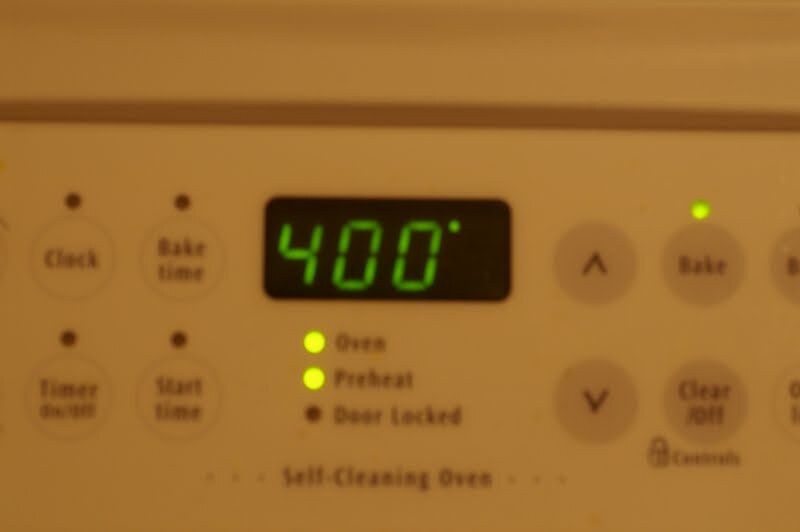 In a food processor pulse the baking soda, baking powder, sugar and salt. Just until combined. Add butter and pulse until mixture resembles wet sand. Transfer to a large bowl and add milk stirring to barely moisten. 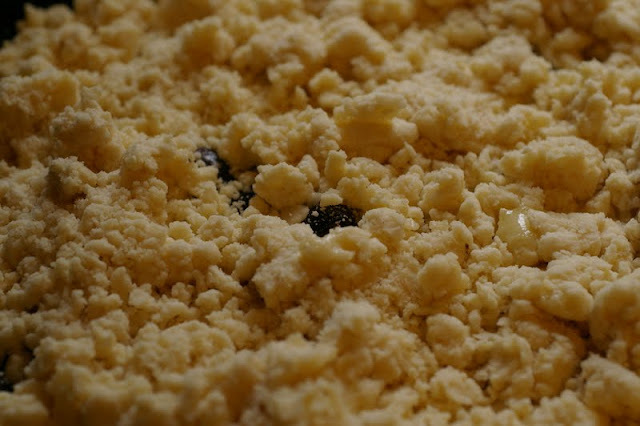 Carefully remove hot skillet and crumble dough on top of the cooked fruit, scattering it all over. I like how some of those blueberries are peeking through the dough. It is as if they are winking at me. As if they are telling me, I am going to be really good when you are finished. 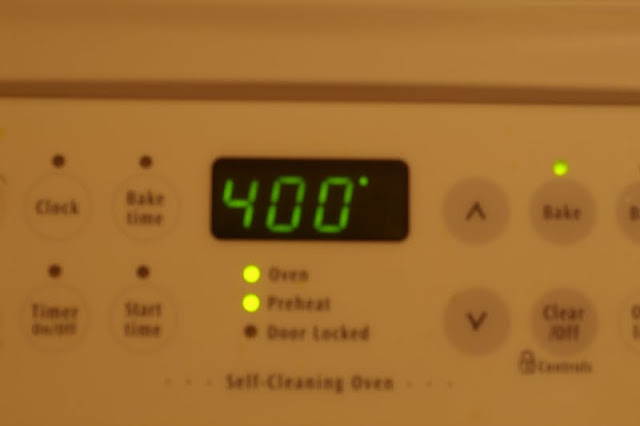 Increase the oven temperature to 425, and bake another 30 minutes until the top is golden brown and the fruit is bubbling hot. Try to wait 15 minutes before you dig in. Veronica, This is looking great! I love Cobblers. Oh, that topping is gorgeous!! 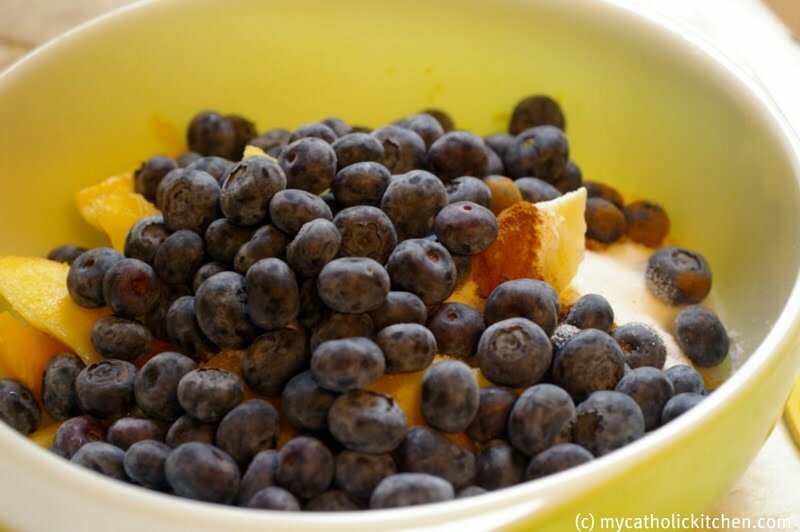 And I love the combination of blueberries and peaches…yum! I love making things in a skillet! I recently bought a couple mini skillets for individual sized desserts! WOW! That looks so amazing! The topping is so yummy looking! What a gorgeous dessert! I am obsessing over the topping! I like cobbler over pie any day. I think that Step and me would have a fight over just eating the topping. Simply delicious. This looks totally delicious! Love the combo and especially love the crumb topping!!! I could totally sink my teeth into that… wow. So good! *sigh* this looks amazing! Your photos are absolutely beautiful as well! I need some ice-cream and a spoon…. Your cobbler looks amazing! Warms with a scoop of vanilla ice cream = heaven! I have been dying to get a cast iron skillet and for recipes just like this one! Looks delicious! Love this time of year because of all the fresh blueberries. This looks totally delish! mmmmm! I bet this was fantastic!! 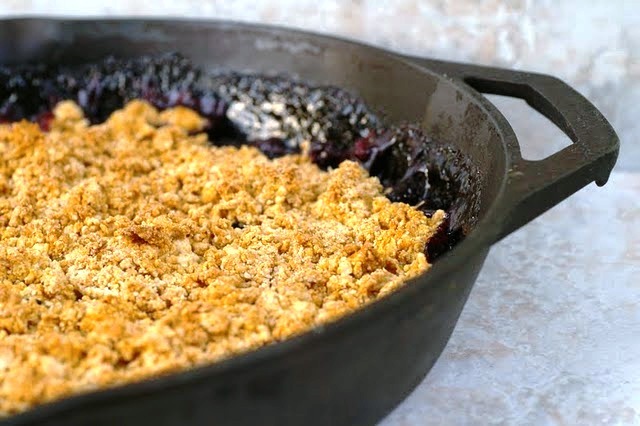 I love a cobbler baked in a skillet! Veronica, this sounds wonderful. I love the combo of orange and blueberry. We just got a new cast iron skillet at my bridal shower!! I can’t wait to use it to make this! Great combo and absolutely delicious! 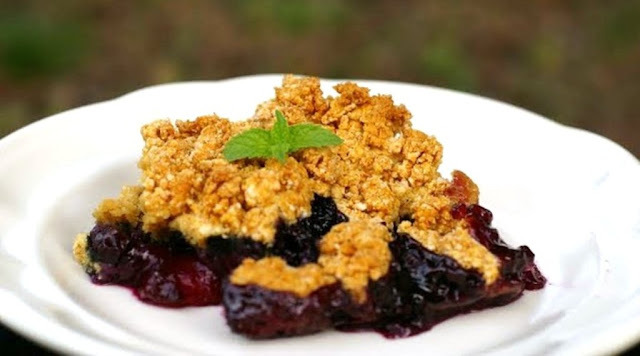 I looooove berry season and I love love love cobbler- lovely post! Hmm, I love cobbler too. This sounds like a winning fruit combination. This is seriously why I love summer: COBBLER TIME! This looks lovely! I just love how you’ve made this right in the skillet! Yum!